I was recently asked to be a judge at the Mrs. Canada Globe pageant. So many people since then have been asking, what was your reaction? Why do you think they asked you? And most of all, “How did that work?” So here it is. I am going to answer all of your questions right here. Why me ? Well I think you would have to ask the organizers, but, in talking with the organizers their pageant is more than outward beauty; it is about their personality, character, leadership, volunteerism, and everything that is on the inside. 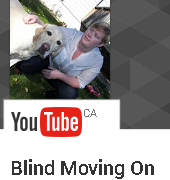 I pride myself in being a vocal advocate for the blind and partially sighted community and breaking down the misperceptions that are out there around blindness. This was something that I never thought that I would be a part of, as it seems like a very visual thing. But I was honoured to have been asked to be a part of this pageant and think that this is a step in the right direction. There are so many women out there who think that their outward beauty is all that matters and they have to look a certain way to be successful or to be liked or to go out in the world. That is not the case what is inside is what truly counts. Your character, personality and everything that you are is so much mor important. Me being a part of this pageant shows that, this is the case even in the beauty pageant world. How were you able to be a judge for a beauty pageant ? How the pageant worked was there was a preliminary round where they did a introduction, which was a 1 minute speech on themselves or whatever they wanted to tell us. Then there was the swimsuit as well as the evening gown portion. After the introductions and before the swim suit portion I went back stage and got to meet the girls and had them describe what they were wearing in the swim suit competition. This was to give me a chance to talk to the ladies and see how they interacted with me, were they genuine, were they comfortable, and confident in themselves. During the evening gown portion the ladies had to answer a question for the other judges and myself to get to know them as well, and this was part of their scores. After the preliminaries there was the finals. The scores from the preliminaries were thrown out and they got a score on overall performance or impression and the question that they had to answer. The questions that they had to answer were deep and had to have some thought put into them, they were very moral based and I liked hearing what they ladies had to say on some very heavy topics. The ladies that were a part of this pageant were intelligent, leaders, volunteers, and all around great women. They had so much to offer and had been very successful in their lives. They were strong independent women who were confident, and sure of themselves. I applaud them for having the courage to put themselves out there and be a part of this pageant. They are all doing amazing work in raising money for charities and being true leaders in their communities, and that is what makes every last one of them beautiful. So how did I judge a beauty pageant, I judged it the same way I judge the world around me. I listened to what was going on, I listened to what they had to say. I listened to how confident they walked down the runway. And I was able to truly get to know them the real them and leave all the superficial things behind. When people are blind or partially sighted they don’t miss out on the world around them, they simply experience it differently and the same goes for a beauty pageant. My key to independence was in my hand the whole time ! I remember the day that I was handed my very first white cane. I was in grade 8 and all I could think was ” you don’t think my huge giant sized textbooks, my magnifying glass, and computer don’t make me stick out enough. Oh wait it was the Teachers Aid that was following me around to every class that kept my blindness incognito right? ” I remember thinking there is no way I am going to use this, I mean if I tripped I just made a joke of it and went on about life, and if I was running with my friends and hanging out at night girls who are 13 and 14 hang onto each other all the time so that was easy enough. There was a point when I was in grade 10 when I decided ok maybe I need it a little bit and did a little bit of a trial and started using it at school and it did just what I thought it would. It brought more negative attention to me, and god knows I was receiving plenty without it. I never used my cane on a consistent basis until I was in University. I really found that when I transitioned to University I had a hard time navigating alone and with the transition from High School to University was also the transition of living with my parents on the farm to living in the city alone. I never used my cane outside of school when I was with friends because I hated feeling like I was the odd one out and I always felt like people were staring at me. It wasn’t until I had a major change in vision that I had to use my white cane no matter what there was no other option. I was not happy that I had to start using my cane every day all day and rely on it but it was only a few months into my significant vision loss that i realized that I had been really looking at the white cane with the wrong attitude. The white cane did not stand for disability, difference, and inequality but it stood for Independence, confidence and the key to a life that I wanted to live. Once I opened up to looking at my cane differently my whole world opened up. I was able to travel where I wanted when I wanted, it gave me the confidence to take on new adventures and really tackle the world. I had always thought growing up that my blindness was something to be hidden to be ashamed of, yet that wasn’t the case at all. It is something to embrace, be proud of and live the life I want despite being blind. After finally embracing my cane it felt like it opened up a whole new world, and a whole new person. I slowly became more confident, more vocal, more social, and found the person that I wanted to be which was always hidden away trying to keep this secret that no one could ever know. When really my blindness is what makes me me, it is a part of me like my eyes are green and my hair is blonde or red depending on the time in my life ha ha ha. I wish that someone would have told me that I was holding the key to independence every time I picked up my white cane much sooner, or that I had figured it out much sooner. Now to show the world, this week is White Cane week a time to educate the world on what the White Cane is and what it stands for, do not fold up your cane and hide it in your closet walk with your head high and proud that you are able to live the life that you want because of that white cane.